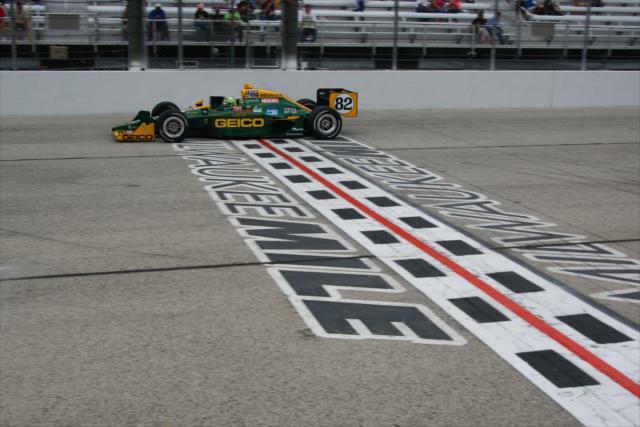 After an absence through the 2010 season (the first year since World War 2 that an open wheel race was not run on the prolific one-mile oval), the IZOD INDYCAR drivers and teams happily returned to the Milwaukee Mile. A revived event, the 225-lap affair at the Milwaukee Mile started under overcast skies to a less than packed set of grandstands. Though the empty seats might have been more plentiful than a promoter would desire, the loyal open wheel racing fans who showed up for the event were treated to one of the most thrilling events so far on the 2011 IZOD INDYCAR Series calendar. Taking pole position on Saturday over Penske Racing's Helio Castroneves, Dario Franchitti and his #10 Target/Chip Ganassi team were looking for their second win on an oval for the 2011 season. As the green flag dropped to on the 26-car field of The Milwaukee 225, a few contenders would quickly be ruled out of the event. Into the first turn of the opening lap, Ryan Hunter-Reay spun-out in his #28 Andretti Autosport car. Unlike the last IZOD INDYCAR race at Texas Motor Speedway where caution fell only once in the double-race format, the one-mile oval event at Milwaukee demonstrated more of a challenge against the teams and drivers. Of the 26 drivers starting The Milwaukee 225, 9 were making their first IZOD INDYCAR starts at the race track. 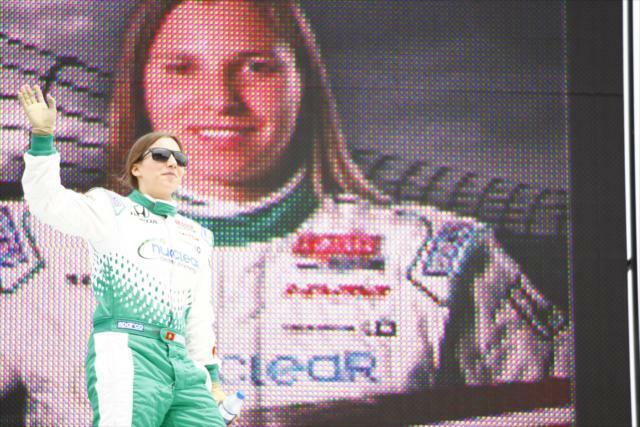 Of those drivers was 2010 series rookie of the year contender Simona de Silvestro. Striking the wall hard in Saturday's qualifying session, it was unsure if de Silvestro would gain medical clearance to drive less than 24-hours since her crash. To the delight of the fans, the #78 HVM Racing car and driver Simona de Silvestro took green for The Milwaukee 225. Quickly gaining the reputation as one of the toughest drivers on the circuit, the Swiss racer de Silvestro weekend resulted with a driving a damaged, slow #78 car HVM Racing made a painstaking effort to start shotgun on the IZOD INDYCAR field. Competing just 11 laps on the Sunday afternoon, the 22 year-old decided to park the Indy car rather than risking her luck on the tight, fast Milwaukee Mile. Aside from de Silvestro, there were other drivers and teams missed the race setup for The Milwaukee Mile 225 event. The lead cars guided by Dario Franchitti lapped the #77 Sam Schmidt Racing car driven by Alex Tagliani for the first time prior to the 25th lap. Finishing 29 laps down, the hard day for the two-time pole-sitting team ended with the #77 as the last vehicle running on track. While Tagliani stuck out the entire race run with an ill-handling race car, AJ Foyt's #14 driven by Vitor Meira join the HVM Racing #78 with self-appointed retirement from the Milwaukee event after 75 laps. Through the first 116 laps, Dario Franchitti was the event's only leader. Holding onto the top spot even during a pit stop occurring as the field was under caution on lap 66, Franchitti managed the Sunday afternoon race comfortably in the lead. Unlike his #10 teammate, the #9 Target/Chip Gannasi Racing car of Scott Dixon found the race particularly harsh off the start. Getting overhauled on track by Takuma Sato and Tony Kanaan early, Dixon would become acquainted with the strong beginning for the KV Racing Technology squad. However, during the first round of pit stops, Scott Dixon and the #5 of Sato would become involved with a wild altercation. While there was no contact, the #9 car was briefly impaired from entering his pit by Sato. Due to mediocre pace on the race track and pit road troubles, New Zealand's Scott Dixon struggled in the lower top-10 through the race eventually coming home 7th place. Along with the anxious moment as a collision was averted, tire changer for the #5 KV Racing Technology team was hit by Sato's entrance. Committing an infraction in the INDYCAR Series rules, the Japanese former Formula 1 driver to serve a drive-through pit penalty. At the end of the event, Takuma Sato and team salvaged their run following the early miscues finishing The Milwaukee 225 in 8th place. As misfortunes first the one leading KV Racing Technology team, the #82 team car of Tony Kanaan was having another strong event for his new IZOD INDYCAR Series ride in 2011. Chasing down the #10 Target car, Kanaan's British racing green Geico-sponsored machine caught and passed leader Franchitti on lap 116. A big shift in the tone of the event as well as the balance of racing power in the IZOD INDYCAR Series, Kanaan aligned with the KV Racing Technology organization has become a refreshing spoiler in as many races. 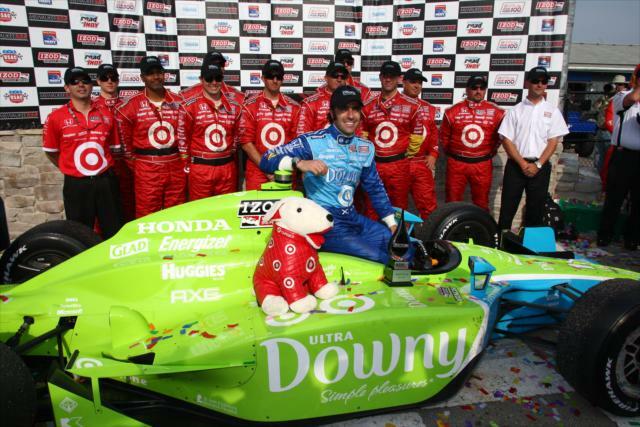 At Milwaukee, Tony Kanaan battled the #10 car of Target/Chip Ganassi Racing on two occasions to lead in the 225 miles of competition. One time Dario Franchitti was able to retake the top position was on a restart following the lap 123 crash of JR Hildebrand. Showing a start car on the early stages of a green flag run, Franchitti was eventually run down by Kanaan through longer periods of caution-free racing. After the race's 5th caution on lap 165 where the yellow flag flew for the damaged car #59 car of EJ Viso, a final set of pit stops for the lead cars prepared drivers for the final 51 laps remaining of the Milwaukee Mile race. A controversial development between the pits of the #10 Target/Chip Ganassi Racing team and the #12 Penske Racing team. Entering his pit stall, Franchitti made contact with a crew member the #12 team for driver Will Power. Seen as similar to the incident for which Takuma Sato was penalized for earlier in the event, the INDYCAR officials ruled there was no fault by the #10 car's driver or team thereby allowing Dario Franchitti to remain in the thick of the important event's latter stage. Beating out both the #10 of Franchitti and the #82 of Kanaan, the renowned teamwork of Penske Racing showed up big time as the #3 car of Helio Castroneves was sent out ahead of the other lead cars. As the race restarted, Castroneves was pulling away appearing as if he could cruise to victory at Milwaukee. However, with 39 laps remaining, the Brazilian driver reported to his crew an instinct that a Firestone racing tire was low on the #3 Penske Racing Dallara. It worry of low air pressure in the left rear tire was confirmed by the Penske Racing team's pit telemetry. As the leader of The Milwaukee 225 contemplated whether to give up the lead for a tire change or risk remaining on track, Helio Castroneves' decision was practically resolved when caution came out for the 6th and final time on lap 195. The reason for the yellow flag was the crash of race contender Tony Kanaan in oval's turn 4. Losing control of his #82 car in the late stages, a disappointed Kanaan exited the KV Racing Technology for an unceremonious end to a solid race performance. During the caution, Helio Castroneves and the Penske Racing crew gave up the lead in order to change questionable tires. In a matter of only a few laps, Dario Franchitti was presented not only the lead but the comfort of having both of his primary competition out of the equation. To the checkered flag, Dario Franchitti stormed across the line ahead of the #83 of Graham Rahal (Rahal is one-half of Chip Ganassi Racing's second team). From 3rd to 5th, Oriol Servia, Will Power and Danica Patrick came across the line for excellent finishes. In the overall IZOD INDYCAR driver standings for the 2011 year so far, Dario Franchitti and Will Power are tied at the top of the points. 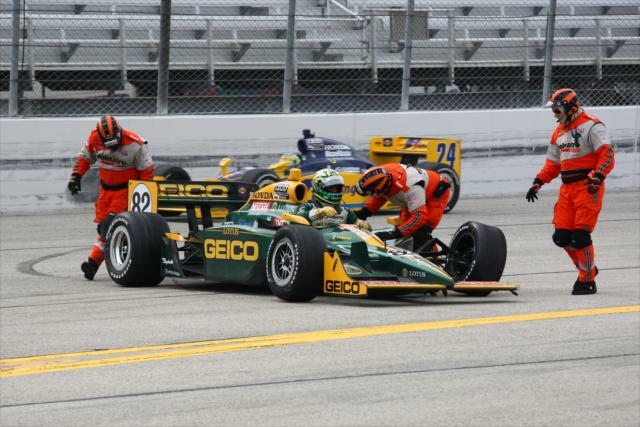 Preparing for their last June race at the Iowa Speedway, the appearance in Milwaukee has given the IZOD INDYCAR Series some moments of action and suspense American open wheel racing fans will continue to hunger for through the duration of the IZOD INDYCAR Series season.